I came to Slovenia with my family in the summer of 1992. We came as refugees due to the war breaking out in Bosnia and Herzegovina. We came to Slovenia, because my father had been working here previously. I came as a seven year old, just on time to start with my primary school. Later on I successfully graduated as a Construction engineer. Today I work in my profession. I started working in the construction engineering for many different reasons. One of the reasons is that I had successfully graduated from vocational school for construction technician. In that time, eight years ago, the construction engineering was at its peak and there has been a lot of work for people of my skills. Salaries were pretty good too. A great credit for the fact that I ended up in the construction industry goes to my father, who is a professional carpenter. As I watched him at work, I started to love that profession. For a person with refugee status it was practically impossible to find any kind of regular employment, so my first jobs and salaries started in 2007 when I already had permanent residency in Slovenia. I started working through student employment (a special temporary working arrangement for students in Slovenia, where salaries are taxed substantially lower compared to normal salaries and no payments for health and pension insurance are made). The work was occasional and I did it during holidays. I have done my first student work in the same construction company with whom I am cooperating to this day. Nowadays I work as a chief of construction on a building site and as an enumerator. My first regular job came by the end of 2007. It was temporary employment. At that time I wasn't a Slovenian citizen and in order to get a job I needed a work permit. I submitted an application for a work permit to the administration unit and waited for about three weeks. Later on I successfully acquired Slovenian citizenship and now I have no problems with work permits. The outbreak of economic crisis, which has mostly affected construction industry, brought a lot of turmoil and I got to the point of losing my job. Luckily, I found a new job for two years period in the field of cultural education, where I have worked before as a volunteer. Today, I work again as a construction engineer, in the same company but only as an external cooperative. I registered myself as an independent contractor and now I issue invoices for my work and pay for my health and pension insurance on my own. Generally it can be said, that majority of people employed in construction in Slovenia are Bosnians, either as citizens or in origin. Such is the case with many of my coworkers who came to Slovenia in the last ten years through working visas. The biggest reason for their arrival to Slovenia was poor economic situation in Bosnia. At first they worked only as seasonal workers for few months on temporary working visas and later on they were usually able to arrange a three year working permit, and after that a permanent residence in Republic of Slovenia which provides for a permanent work permit as well. Considering the general economic situation in the country, where we all cope with crisis, my migrant co-workers are pretty much satisfied with our company. They are not satisfied with salary reductions that were imposed at the time when the company’s earnings decreased. But still, wages are relatively regular in our firm. The investors we work for often run late with their payments, but even so, our wages are paid by the end of the month for the previous month. In other construction companies, workers had many problems due to unpaid contributions for their pension and health insurance. In our company, contributions are regularly covered. So far we haven’t yet discovered or heard of any complications on that matter in our firm. I also know that all of my migrant colleagues have their health insurance regularly covered. A few minor accidents have happened on our construction sites and all workers were adequately treated in health facilities free of charge. This has often not been the case with migrant workers from other companies. My co-workers are mostly employed for fixed short terms, primarily due to the crisis and uncertainty in construction. These jobs are set for a period of three months up to one year. Only few of them are employed for a long term. These few work in a company from the start of it. Generally among the migrants there is a lot of illegal work. Salaries are low and irregular, and people have no choice but to find an extra job. Through informal channels they find some minor jobs and in this way they compensate for small salaries and collect enough money to pay their rent and send money to their families in Bosnia. The situation in the construction industry itself is now much worse than in 2007. Shortage of investments, low wages and irregular payments are affecting the companies and on the end of that chain, it is the ordinary workers who suffer the most. All of this usually breaks down even harder on the migrants. 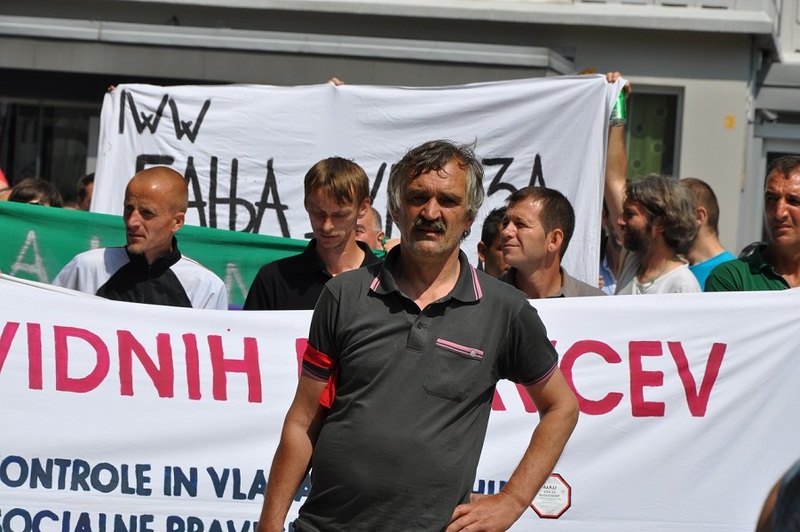 Larger companies such as Vegrad, Primorje and SCT, still owe several earned wages to their ex workers. All these workers have lost their jobs on a very short notice and ended up on the street, without money. Many people have returned to their homes penniless. 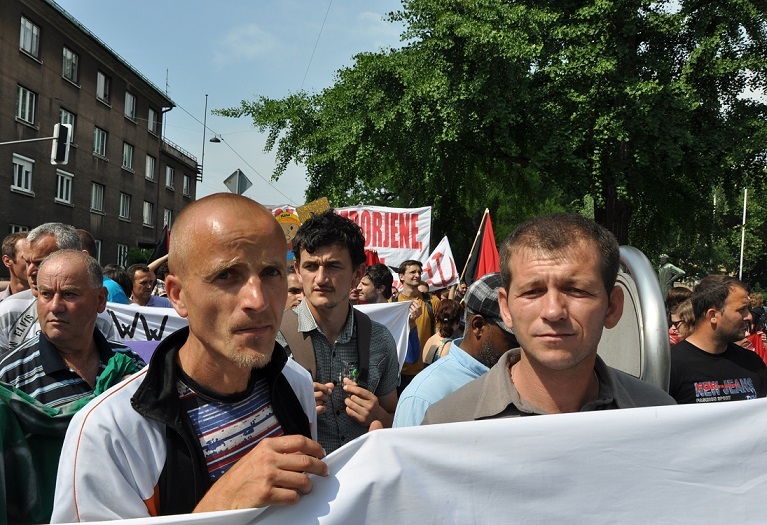 Some of them have even borrowed money back home and sold their cows in Bosnia to be able to pay for their living in Slovenia, hoping that they will get their salaries in a short time. Unfortunately, that has never happened. I personally have witnessed firsthand one of the saddest stories when workers came to work and could not afford a lunch during a regular working day; they did not have money to buy one because they didn’t receive their salaries for several months. Workers from the other company that were working on that site with them, collected among themselves euro by euro and bought them lunch. They could not watch other workers not eating while they were enjoying their meal. All these sad stories are the result of the economic crisis. However, the latter is many times just an excuse for some employers to exploit their workers even more. This article is one of the migrants’ contributions to the project Migration to the Centre and was created in the cooperation of the Peace Institute.